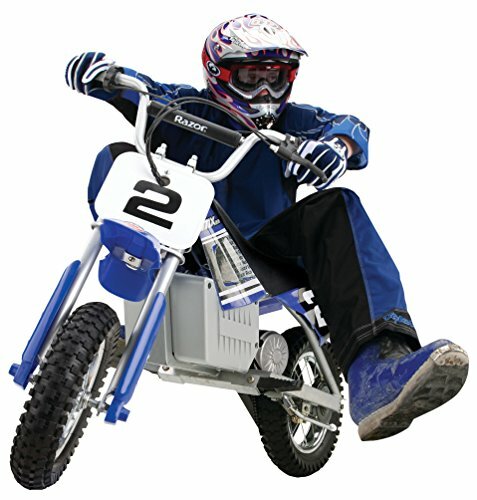 So your kid won’t stop talking about dirt-biking but they’re not ready for the speeds of a gas-powered 50cc. You could do a lot worse than investing in a trainer bike that will prepare them for trails without risking their safety. Razor is a brand that is almost synonymous with personal electric transport. 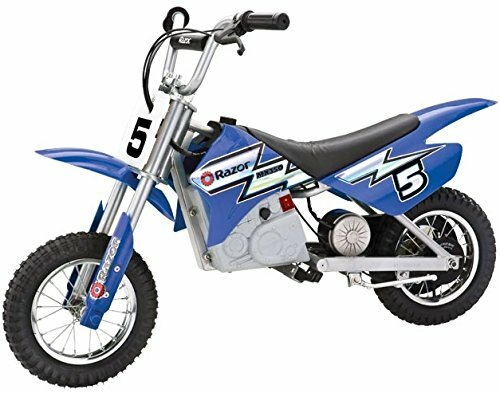 The MX350 is for kids who like life on the extreme side but aren’t ready for 50cc’s. It’s looks the part, opting for the classic dirt-road bike appearance and a bunch of racing decals. But how does it perform? Keep reading to find out. Kitted out with racing decals alongside a classic motocross design we can’t deny that the Razor MX350 looks cool. The front-shocks look ready to eat up the trail but don’t be fooled, this is a kid’s toy. Standing at just 31” high and 44” long you’ll have no problem packing this up in the car boot. 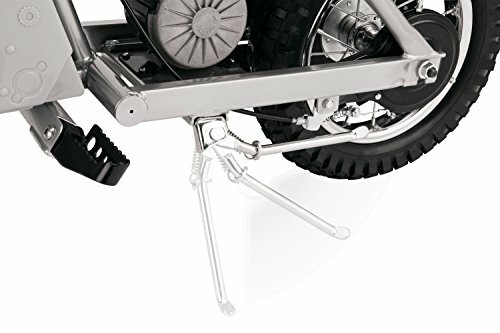 The retractable kickstand and folding foot pegs mean you can squeeze into the corner of your garage with no problem. The engine draws its power from two 12v batteries which give it a top speed of 14mph. It’s a chain driven motor which offers a lot of lifespan but suffers when it comes to torque. This is especially true on hills when you lose speed rapidly. Twisting the handle-bar throttle delivers a smooth, albeit, limited acceleration. The MX350 comes equipped with front facing two-forks which are designed to lessen the impact of trails. The wheels are air-filled delivering a relatively smooth and stable riding experience. That’s really where this product stands out, the handling in responsive and, ultimately, delivers a very safe riding experience. Like a push-bike, engaging the brakes is a matter of squeezing the handle-bar lever. We felt this would be easy to get to grips with for young riders. The problem for us is on hills where the rear brake could really do with the added assistance of a front brake or even a disc to deliver faster stopping power. You can fill the tires on this bike using a standardized bicycle pump. Their air-filled which means you don’t have to worry too much about pressure and can customize them as you see fit. Softer tires will, of course, impact speed but also provide a smoother ride on tarmacs or dirt. There’s not much to see in terms of tech and we were a little disappointed with this aspect. You don’t even get a heads-up to see the battery life. Out of the box most of the bike is fitted together. You must attach the front forks and handlebars yourself, as well as the licence plates and mud-guards. It can all be done relatively quickly using household tools. 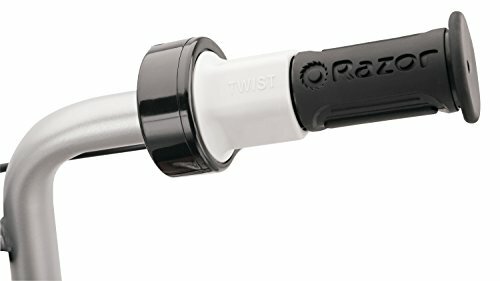 If the tires are lacking air, you can refill them using a regular bicycle pump. This bike runs on lead-acid filled batteries which take an age to charge. They also don’t deliver as much power and add significant weight. We felt that with a lithium battery you’d getter a faster, more practical product. While reasonably priced, the MX350 comes up short in comparison to the competition. The performance is somewhat limited although the build quality does seem sturdy and well made. If your primary concern is safety, then this could be the product for you. The MX350 sacrifices performance in favour of safety which is no bad thing. The problem for us was the price in relation to performance and the long charging times. 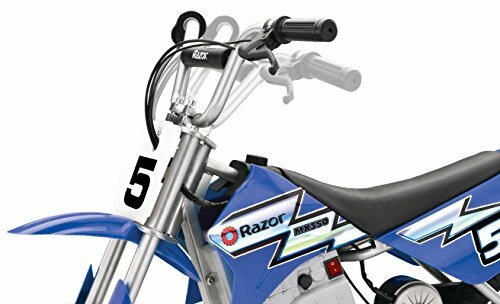 As a first bike, it will be a lot of fun for younger users but would struggle on dirt trails and should be used primarily in parking lots and driveways. Practical, easy to set-up and portable, the MX350 isn’t an inferior product but it’s not a market leader either.